Join the Multicultural Center and International Student Affairs (MCISA) in welcoming our new class of international student to St. Louis from all around the world! Their orientation will be held on Monday, Oct. 17. 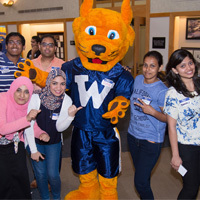 Orientation includes a Student Resource Fair for new students to view and print their student class schedules, open bank accounts, set up mobile phone services, learn more about billing, career planning, campus involvement, and much more.